“The boys and girls in the clique. The awful names that they stick. You’re never gonna fit in much kid, but if you’re troubled and hurt, what you’ve got under your shirt will make them pay for the things that they did!” (Gerard Way, My Chemical Romance). Don’t Cha Wish Your Scouser Was Boss Like Me? (Don’t cha), is a small glimpse into the life of 17-year-old Kate – an egocentric, confused and desperate teenager who wants to win over her crush, Jay, with the help of her imaginary friend Mabel (who conveniently is her accompanist on the piano). 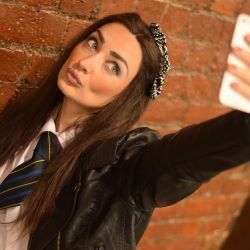 As much as MAP productions are expressing the hilarity of teenage angst in this production, they are also presenting to their audience the traumas of being a school girl through the majesty of song! ‘Don’t cha’ melds a string of overt and cleverly lyrics with anthems from musicals that are recognisable from the first note. As Kate explains her innermost thoughts and most personal (often too personal) lifestyle choices, we delve into songs from such musicals as The Lion King, The Phantom of the Opera, Matilda, Chicago, Mary Poppins and many many more. All this results in a series of utterly hilarious song routines that were as impressive as they were amusing. To start with, both performers had fantastic voices and were able to sustain the audience’s attention when in song – a tough task considering the subject matter of some of the songs (such as waxing one’s pubic area midway through an adaptation of The Phantom of the Opera). The quality of performance from both the female actors made the audience completely comfortable with immersing themselves in Kate’s undisguised world. The lengths Kate went to in order to ensure the audience appreciated her strifes were, at times, exceedingly grotesque. Sanitary products scattered across the stage, a vomit bucket that was used more than once and the repeated grabbing of what she’s “got under her shirt” were just some of the outrageous moments gifted to the audience. Shocking, scandalous and sickening – I laughed throughout all of it! There was clearly no holding back by MAP productions and the way this subject matter was so cleverly integrated into famous musicals means that huge credit must go to the writer, Gemma Brodrick-Bower. The arguments between Mabel and Kate were also a highlight and this comes from a well-devised script. Running at an hour long, ‘Don’t cha’ just about gets away with not running out of ideas. By the end, you feel satisfied by Kate’s story, but do not particularly leave wanting more. The shameless element is somewhat exhausted and in the second half, once the initial impact of the musical infusion is relaxed, the humour is reduced and it loses the big laugh out loud moments. This should not take away from what MAP productions have achieved – as this musical is very entertaining and relevant to teenagers today. It has the feel of perhaps working stronger as a reoccurring series of sketches amongst other characters or stories. That said, ‘Don’t cha wish your scouser was boss like me?’ is certainly successful in making its audience laugh hysterically – just make sure you know your musicals! Don’t Cha Wish your Scouser was Boss like me?